This is a book that will help you get everything you want. Goals! helps readers set goals for themselves and achieve them using the tested and practical advice given in the book. 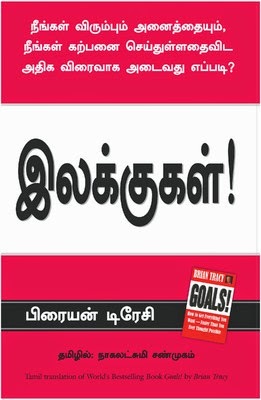 This book informs readers of the seven important aspects of setting goals. It was published after around forty years of research and includes advice that comes from personal experiences. Goals! teaches us how to build our self-confidence and self-esteem, as these are the two most important things for any individual. This step-wise guide will help us in our mission and readers will learn how to overcome obstacles. The real-life examples given in the book will inspire and motivate people. Brian Tracy, author and motivational speaker, has authored books like The Psychology of Selling - The Art of Closing Sales, 21 Great Ways To Get Paid More and Promoted Faster, Change Your Thinking, Change Your Life, The Power of Charm - How to Win Anyone over in Any Situation, Earn what You're Really Worth - Maximize Your Income at Any Time in Any Market and Victory! - Applying the Proven Principles of Military Strategy to Achieve Success in Your Business and Personal Life. He Canadian-born has over thirty years of experience in the fields of economics, philosophy, psychology, history and business. He founded Brian Tracy International, his own company. In addition to this, he also functions as the President of three companies in California.